Express your gratitude with this delicious gourmet gift basket of cookies, chocolates and more. 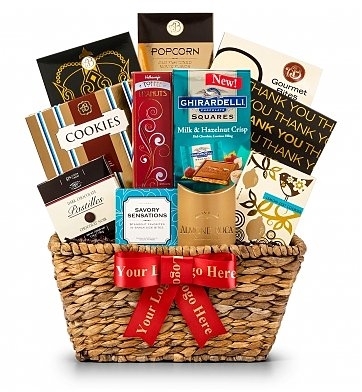 Show your gratitude with a delicious gourmet gift basket full of fresh-baked cookies, seasoned popcorn, toffee peanuts, and Ghirardelli chocolates all packaged in a beautiful woven basket. Items are packaged in a lovely woven basket. Arrives decorated with a hand-tied satin ribbon with optional personalization. Measures 15" x 12" x 7".